160,000 children a day skip school because they fear being attacked or intimidated by other students. 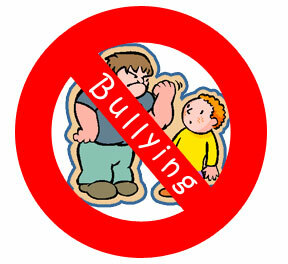 Bullying is real, it is an ongoing problem, and it will most likely happen to all our children at some point in time. As parents, we all worry about our children being teased, taunted, and bullied. First, we realize, that no matter what we do, OUR KIDS WILL FACE CONFRONTATION in their lives. In school, in college, in the work place, in their neighborhoods, in marriage. Confrontation is part of life. We have to prepare them for it. Waiting until our kids are bullied is not a good time to start addressing the issue. Children who feel embarrassed or humiliated about being bullied are very unlikely to come home and share how they feel. Instead they will withdraw and suffer alone. Make it clear to your children that you are always there to listen, and that you know bullying can happen. Use situations and find ways to bring up the subject and discuss it when they are young. When our kids try and talk to us, we have to listen. They will drop little hints when there are bullying problems. It is easy to miss the cues when we are not really listening to what is being said. When our kids talk to us, we need to put everything else aside and really be in the moment to listen. Give your children different scenarios and teach them how to handle them. "What do you do if...?" Go through each situation and teach them what to say and do. It will empower them, and when they are faced with the bully they wont be as intimidated because they will have had experience and practiced what to do. We have to teach our children how to deal with conflict and confrontation. Teach them to manage their anger, communicate, and listen. Teach them how to compromise and be patient. This is done through everyday life situations and role play. As conflict happens in your home, between siblings, use it to teach. We also must be good examples of conflict resolution in our own adult lives. Give them a hobby, interest, sport, talent, where they can excel. We should involve our children in healthy activities where they find success. Something they like, that challenges them and where they can excel. Whether it is sports, a hobby or an interest. These activities will boost their self confidence. They teach children how to solve problems, deal with others and speak their minds. Research teaches us that helping your children build their self confidence is one of the best defenses against bullying. As parents, we need to model kind, gentle behavior for our children. They learn by watching us. Be sure that the other adults and kids that are around our children demonstrate empathy as well. We need to teach our kids to try to understand other's points of view and to feel compassion towards others. If we are always raising our voices, showing impatience, and arguing, they will do the same. Let kids work things out on their own. As parents we can be very quick to step in and stop the arguing and disagreements between our children. We decide who we think is entitled to "winning" and then go about our business, happy with ourselves because the arguing and disagreeing has stopped. We need to let our children work out their own disagreements. If we will sit back and watch, they will almost always be able to solve their own problems. These family situations are the perfect place for them to practice working through conflict when dealing with others. Just because the bullying is verbal, doesn't mean it hurts any less. Verbal bullying leads to the same negative effects as physical bullying. High levels of emotional distress, loneliness, lower self esteem, depression and anxiety. Acknowledge your children's complaints and concerns. When is it okay to teach our children to fight? Teach that it is never okay to fight. For the most part, nothing good comes of fighting. Fighting is not the answer. That said, we need to teach our children that they stand up for themselves in self defense. They should know that if they need to defend themselves because they are being, or going to be physically attacked, then they defend themselves. And, that if they do have to fight in self defense, that you will understand. They need to know that they always defend themselves if/when things turn physical. Involved dads make a huge difference in the confidence of their children. Dads need to not only model strength and confidence, but sympathy and empathy. If there is not a dad that fills this role for your children, seek out a strong male role model who can help. Parents can do so much to help their children deal with bullying and not become bullies. Start early with your preparations. WERE YOU EVER BULLIED AS A CHILD? AS AN ADULT? Could you give us some questions to ask and answers to give during role play? A list perhaps for elementary grades? I am drawing a blank. I saw your KSL story! Great Job! This is very sound advice! I think I'll try and talk to my 4 year old about bullying before she starts pre-school this fall. I have a "teen" blog (for parents of teens) and I have several posts on bullying. There is nothing that makes my blood boil more than bullying. Parents have got to teach their kids empathy for those who are different. My oldest was "teased" because she was born without a hip socket, so she limped when she walked/ran & I could see the effects it was having on her, but with 5 surgeries the problem was finally corrected. (She's 21 now). Congratulations on your SITS Day!!! Your blog is so helpful to us, thank you for sharing. We are dealing with a subtle form of emotional bullying against our teen daughter right now, so this piece is very timely. Great suggestions! the more we pay attention and prepare our kids to deal with challenging situations - the better off they'll be. This is wonderful... very good points. Love the suggestion about role playing. We plan to get our son into a martial arts class soon. I think this goes along with your suggestion about hobbies/sports, and I feel like this particular area would be help him develop better assertiveness and also self-discipline. I've always been concerned about the possibility of him being a "bully target" because his personality has been so laid back. He will allow children to just take toys right out of his hand without expressing any disagreement at all. We have had some experience with bullying with my youngest son and in fact, he goes to the school in Sandy where there were two apparent bully-cides this year, both classmates of his. Just tragic. I think the best thing we did for him was to put him a great Scout program. As soon as he was in a program where he felt accepted and had a chance to excel, the bullying pretty much stopped and I have seen a huge difference in him from last year to this. But I do with there were a lot more resources for parents and kids on this issue. You just never know what kids are going to think up from day to day. PS: I was at CBC10 also. It was a good conference. Were you a speaker? I was shocked to have this issue with a fellow student (of my son) in pre-school. And even more surprised with the lack of intervention on the part of teachers who had already written this kid off as "Nothing but trouble" at four! I had to go to the director to resolve it. PS Happy Sits day! My #4 is due Aug 1st Congrats! I love this. So often the "anti bullying" campaign is all about assigning blame and pointing fingers at teachers, parents, kids, the institution... I love the concept of empowering your own kids to handle and avoid it. Giving them the tools to take care of themselves and grow to be capable, strong adults. THAT is the right idea. Love you blog, thanks for sharing all of your knowledge. Interesting that bullying became a significant public issue only after two of its victims staged a massacre at Columbine High School.